Finally the weather gets warm again, not that warm but enough to give me some hope for being outside. I can tell when spring is coming when the flower and garden related catalogs fill the mailbox, some send every month in the hope that if I see it often enough I will buy their products. Looking through the catalogs always make me feel that our garden is too small since there are so many plants I want to put in the garden but there is not enough space. So I have to settle with the ones I like best each year. Spring is the time that my imagination runs wild, my energy surges. This time of year I have insomnia because I cannot stop thinking, planning. As soon as the sun tips the horizon, I’m up. Time to get the seed trays out too. When to start the seedlings is crucial, especially for the vegetables that produce seed pods and fruits. If you start too late you may not get any produce that year. March is a good time to start tomato, at least that’s what my very Italian neighbor tells me and she just started her seed trays. Pepper seeds also need to be started early since it’s tropical and we don’t have that long a period of warm weather. There are many things to do in spring, so little time. I’ve been getting up very early in the morning so I can have my coffee and walk around inspecting the garden at the same time before I head for work. Sadly, my white Primrose was eaten to the stump. The culprit, I think a woodchuck since I didn’t see any hoof prints near by. Most of the tulips and daffodils are still intact. 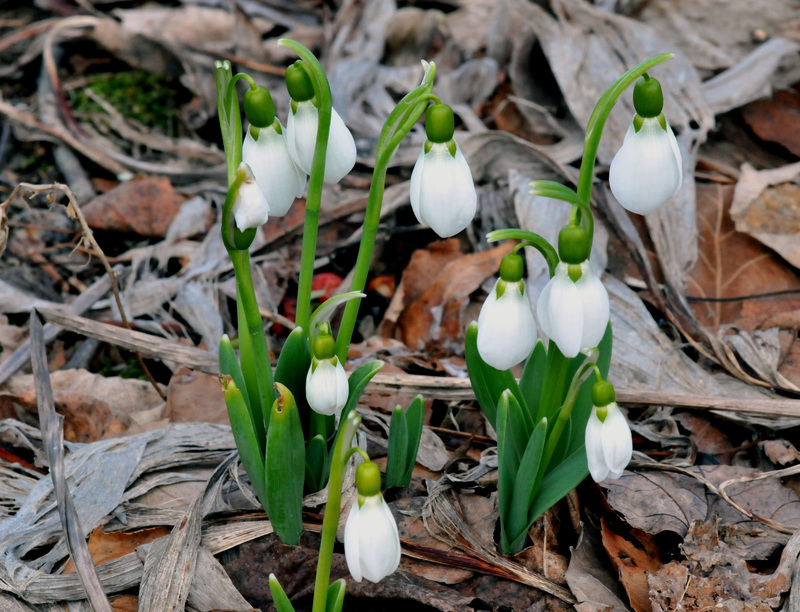 Snowdrops never miss being the first to show off their flowers even when it’s cold and windy outside. Those are the flowers that can take their own time in the garden. Where I have to work against time is with the roses. Early spring is the time for trimming and training when you see the first swelling little buds. Trimming the ramblings is the worst. They don’t want to be trimmed and do their best to fight me with all the thorns they have. I don’t know who abuses whom here. Every time I trim the roses I ended up with scratches all over my arms and legs. And this is with long sleeves, long pants and gloves on. Well, it’s still better than trimming them when they have leaves. This year I invested in a pair of gauntlet gloves to wrestle the roses with. Hopefully that levels the paying field some although the roses may be a little disappointed. Spring is also the time to dream of fresh salad again. Nothing like cutting a few fresh greens, picking sugar snap peas in spring to throw in a bowl for salad.